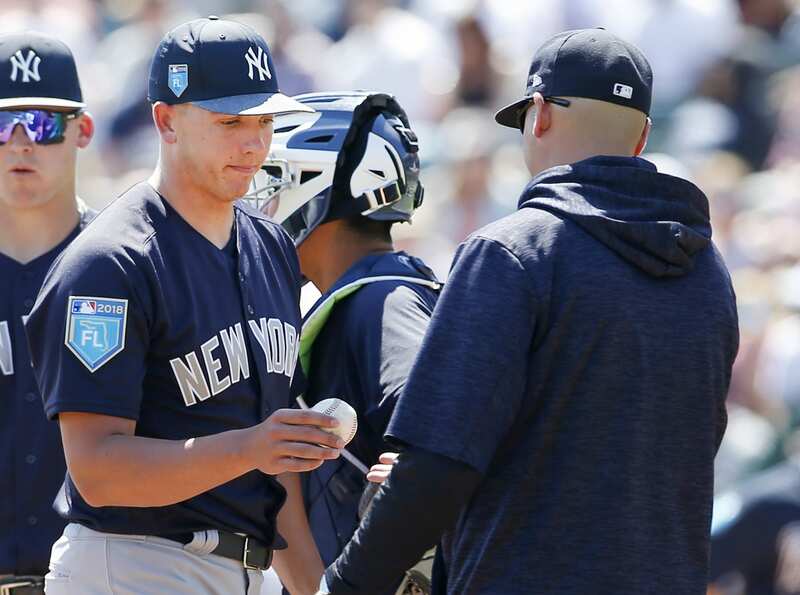 New York Yankees reliever Chad Green gave up three runs in the eighth inning as the Yankees lost to the Astros 6-3. The sad part is that they led 3-2, blowing their second lead in as many days. In five pitched innings on Tuesday, the Yankee bullpen gave up three runs off seven hits. Jonathan Loaisiga only pitched three innings, giving up two runs. He was removed due to throwing 71 pitches in the three innings. Steven Tarpley relieved Loaisiga and gave up a hit, but threw just nine pitches in the scoreless inning. Luis Cessa got five outs without a score, before the ball was turned over to Jonathan Holder. With the Yankees up 3-2, Holder gave up a double to new Astro Michael Brantley before being pulled. After, Chad Green came in and got hammered in the eighth, giving up three runs and the Astros took a 6-3 lead. Gary Sanchez kept up his strong play on Tuesday, going 2-for-4 and knocking in two runs on a sixth inning double to put the Yankees up 3-2. His other hit was a single that beat the shift, as the Astros placed three men on the left side. Luke Voit was responsible for the other run, mashing a solo home run to center field in the first. That was his only hit in four at-bats. Aaron Judge and Austin Romine were each responsible for a base hit. Red hot Clint Frazier went hitless on Tuesday night. Not just that, he had a few problems in the field. He dropped a ball on a diving catch attempt, then misplayed a ball a little later. Brett Gardner also went hitless on Tuesday including being doubled up on a bunt attempt that he didn’t run out. This killed a rally with runners on first and second early in the game. The Yankees try to salvage the series with the Astros on Wednesday before returning home. Gametime is at 7:40PM (ET) on YES Network and FOX Sports Go. James Paxton gets the ball for the Yankees against Collin McHugh of the Astros.